Rep. Ilhan Omar (D., Minn.) on Monday apologized for her anti-Semitic comments over the weekend, but she took another shot at AIPAC during the apology by calling them "problematic." Omar quote-tweeted a tweet by liberal journalist Glenn Greenwald, who was criticizing House Minority Leader Kevin McCarthy (R., Calif.) for threatening punishment against Omar and Rep. Rashida Tlaib (D., Mich.), who is also anti-Israel. Her tweet said, "It's all about the Benjamins baby" with musical notes, referring to hundred dollar bills with Benjamin Franklin's face on them. She received backlash for the comment and was pressed by Forward opinion editor Batya Ungar-Sargon to clarify who is "paying American politicians to be pro-Israel." Omar responded, "AIPAC! ", the name of the pro-Israel lobbying organization. In response to the backlash from Democratic colleagues, Jewish organizations and even Chelsea Clinton, she issued a statement apologizing, saying her intention was "never to offend my constituents or Jewish Americans as a whole." "Anti-Semitism is real and I am grateful for Jewish allies and colleagues who are educating me on the painful history of anti-Semitic tropes," Omar said in a statement. "My intention is never to offend my constituents or Jewish Americans as a whole. We have to always be willing to step back and think through criticism, just as I expect people to hear me when others attack me for my identity. This is why I unequivocally apologize." "At the same time, I reaffirm the problematic role of lobbyists in our politics, whether it be AIPAC, the NRA or the fossil fuel industry," she continued. "It's gone on too long and we must be willing to address it." Omar has a history of using anti-Semitic rhetoric and supporting the Boycott, Divestment, and Sanctions movement against Israel, according to the Washington Free Beacon. 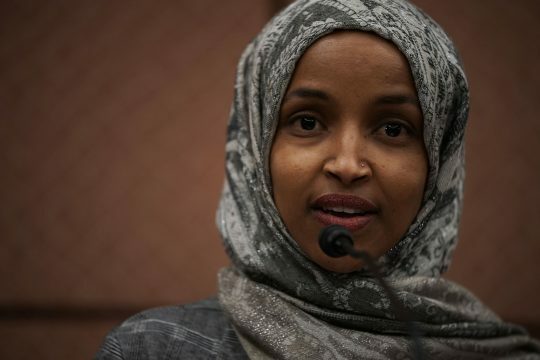 Omar, after first wondering why Jewish Americans would be offended, recently said she used unfortunate language in a 2012 tweet where she wrote Israel had committed "evil" acts and "hypnotized the world." She recently compared Israel to Iran, the world's largest state sponsor of terrorism, and said she was amused at the idea of the Jewish state being considered a democracy. In addition, she and Tlaib support the Boycott, Divestment, and Sanctions movement against Israel, known as BDS. The BDS movement has links to Palestinian terrorist organizations. The Anti-Defamation League has condemned it, and Senate Minority Leader Chuck Schumer (D., N.Y.) said BDS is anti-Semitism in action. When asked by a CNN reporter last week why she supported BDS, Omar immediately walked away. This entry was posted in Politics and tagged Anti-Semitism, Chelsea Clinton, Ilhan Omar, Israel. Bookmark the permalink.